Following the European Directive 2014/104/EU on damages actions for breaches of EU antitrust law (“Damages Directive”), which strengthens the right to compensation for indirect customers of the cartelists, the European Commission (“Commission”) published draft guidelines intended to give national courts guidance in determining the extent to which overcharges based on infringements of Art. 101 and 102 of the Treaty on the Functioning of the European Union (“TFEU”) have been passed on to indirect customers, including final consumers. The draft, which was published in July 2018, aims to harmonize national decision-making practice, and is open for comments until the beginning of October. As a reference source for good practices based on Art. 16 of the Damages Directive, the draft guidelines are non-binding and will not alter existing rules under EU law or the laws of the Member States. They also are without prejudice to the case law of the Court of Justice of the European Union (“CJEU”). Regarding the practical applicability of the draft guidelines, their reasoning may either be used as a "sword" by indirect buyers, who will base their claims on it, and/or as a "shield" by defendants, who may fend off damages claims of direct customers. Hence, the draft guidelines are intended to provide the relevant parameters that can be taken into account when dealing with economic evidence relevant for the assessment of an overcharge. They would complement the Practical Guide on quantifying harm in actions for damages based on breaches of Article 101 or 102 TFEU, and would accompany the Communication from the Commission on quantifying antitrust harm in a damages action. The Practical Guide provides the basis for the existence and extent of the initial overcharges, while the draft guidelines address the passing-on of such overcharges. Accordingly, they should be read together. 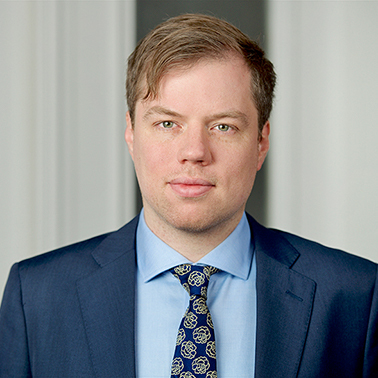 According to CJEU case law, "[a]ny person is entitled to claim compensation for the harm suffered where there is a causal relationship between that harm and an agreement or practice prohibited under Article 101 TFEU." Thereby, claimants are entitled to full compensation, which is to be understood as placing a person in the position in which that person would have been had the infringement not been committed, thus covering compensation for actual loss and loss of profit, plus the payment of interest. In the context of passing-on, this distinction is important for the following reason: The price effect relates to the inflated prices a direct customer has to pay due to the infringement of EU competition law. It typically falls within the category of actual loss, however, if the direct buyer is able to pass the overcharge further down the supply chain, the direct buyer’s actual loss is either reduced (partial pass-on) or eliminated (full pass-on). This results from the buyer’s incentive to raise its prices as a response to increases of its input costs. The volume effect refers to the profit loss due to reduced sales resulting from passing-on, i.e., a lower volume of sales due to increased prices. While the Damages Directive distinguishes between actual loss because of the overcharge, on the one hand, and loss of profit due to reduced sales, on the other, the draft guidelines emphasize the inherent link between the two. Consequently, a three-step test has been proposed which includes (i) quantification of overcharge, (ii) price-related passing-on effect (how were the prices set by the direct customer in the downstream market? ), and (iii) volume-related passing-on effect (what was the volume supplied by the direct customer?). To provide a first estimate or evaluate the plausibility of different economic assessments, the draft guidelines enumerate further factors that influence the existence and the magnitude of the passing-on effects. First, the draft guidelines repeatedly refer to the nature of input costs subject to an overcharge as a relevant factor. Specifically, if input costs are fixed costs for the direct customer, and consequently do not vary according to the produced quantity, a pass-on is less likely because it usually would not affect the price setting (in the short term). To the extent there are variable costs, however, the likelihood of a pass-on is higher because marginal costs typically affect the direct customer's price-setting decisions. If the cartelized product constitutes a very small percentage of the direct customer’s overall production input costs, the pass-on will be less likely or smaller compared to the reverse situation. In our view, another complexity besides the price and volume effects arises as passing-on may occur both in a vertical relation along the supply chain of the cartel (see illustration below, accentuated by the grey background) and in a horizontal relation to the direct customer’s competitors and their customers (accentuated by the white background). Accordingly, the level of competition between firms on the downstream market (direct customers and their competitors) also affects the level of pass-on. Second, the nature of product demand also influences whether and to what extent the initial overcharge is being passed-on. This is because the extent to which a direct customer raises its own price when facing an overcharge depends on the elasticity of the demand. Further factors, which are only mentioned briefly in the draft guidelines, are the effects on the direct customer in case it also sells substitutes or complementary products of the cartelized product (passing on may be more likely or less likely). The Role of Evidence and Practical Methods. When estimating pass-on, the draft guidelines suggest that national courts may use direct evidence relevant to the case. The draft guidelines emphasize that the availability of qualitative evidence (e.g., related judgments, contracts, internal documents on business behavior or pricing strategies, financial and accounting reports, witness statements, expert opinions, industry reports, and market studies) and quantitative evidence (underlying data such as sales prices, retail and end consumer prices, prices of comparable products, volume sales, rebates and other input costs) may play an important role when a court decides whether or which of the quantitative techniques set out can be used by a party to meet the required standard of proof under applicable law. Thereby, the proportionality and effectiveness of generating data are taken into account, which in turn requires clear disclosure rules. The Damages Directive does not distinguish between damages from (i) increased prices (price effects), (ii) reduced quality of products or hampered innovation (non-price effect), and (iii) the potential effects along the supply chain. However, the draft guidelines do not provide any guidance regarding non-price effects. (a). Quantification of price effects. To measure price effects, the draft guidelines propose a direct and indirect approach. The direct approach is preferable as its estimation is based on actual prices. It encompasses comparator-based methods, thus relying on the fact that the comparator scenario can be considered representative for the non-infringement scenario. Hence, it measures the change of margin or price change of the affected market compared to a non-affected market. The calculation is comparable to the one for the initial overcharge, but is often not applicable as the underlying econometric techniques need real-life data observed on the same or a similar market (time / product / geographical dimension). 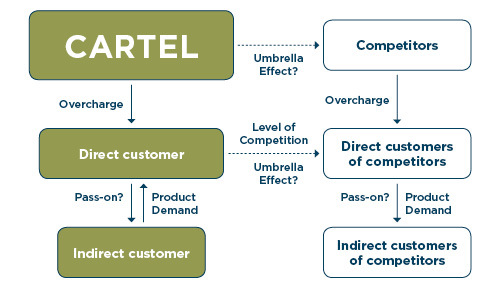 This is because comparator-markets for pass-on effects are often harder to identify, due to the complex market structures as described in the graph above (umbrella effects, level of competition of various market levels). Further, the applicability of another time dimension needs attention, as the pass-on of overcharges may often be delayed. Consequently, as data is often scarce or the collection disproportionate, passing-on may be estimated indirectly. The indirect approach provides an analysis of how previous changes in a firm’s costs have affected its pricing before or after the infringement period. However, the indirect method may sometimes be misleading, and cannot provide evidence of whether the overcharge is actually passed on. Hence, the draft guidelines highlight that it is crucial for courts to be aware of the underlying assumption that changes in input costs during the infringement period are reflected in prices downstream. (b). Quantification of volume effects. If price effects were passed-on, the direct customer may face a loss in profits due to reduced sales. To measure the effect, the draft guidelines propose the direct and the elasticity approach. The former can be estimated directly by multiplying the counterfactual margin by the reduction in sales volumes stemming from the pass-on of overcharges. Again, the comparator-based techniques may be the most precise approach – if possible. The draft guidelines specify that volume effects may also be estimated by using relevant elasticity parameters and combining them with the price increase on the downstream market. The lost volume stemming from an overcharge is influenced by the sensitivity of demand that the customer faces and how the customer’s competitors react to the overcharge. The stronger the competition between the customer’s competitors, the greater the constraint on the ability to pass on the cost increase and vice versa. At the same time, if the customer's competitors also increase their prices in response to the overcharge, this might reduce the impact of the price change. In this regard, the draft guidelines briefly refer to general theoretical modelling, but do not refer to, amongst others, the SSNIP-Test (small but significant and non-transitory increase in price test). (c). Besides the price and volume effects, we are of the opinion that the draft guidelines should be complemented regarding non-price-effects. This is important because non-price effects are (even) harder to quantify, and it is very complex for potential injured parties to provide (and for courts to evaluate provided) evidence. In relation to pass-on, this question becomes even more complex. Furthermore, non-price cartels are more than just a theoretical issue (e.g. Qualcomm v Apple, where exclusionary contracts may have led to less market innovation). Regarding the use of quantitative and qualitative evidence, the draft guidelines emphasize the importance of disclosure as a means of obtaining evidence to prove a pass-on. They explicitly refer to both scenarios and emphasize that disclosure may be relevant for indirect customers to prove that they were affected by the infringement, as well as for the defendants to provide evidence that their direct customers may not have suffered losses. Hence, disclosure of evidence serves the effective exercise of rights and the equality of arms, and is essential for effective private enforcement. As indirect customers often face information asymmetries, disclosure rules are from our perspective an effective way of leveling the playing field and giving the indirect customer an equality of arms. On the other hand, the draft guidelines also emphasize possible constraints to the right of disclosure. For example, disclosure is limited to instances where the party bears the burden of proving the existence of a pass on, thus the scope of disclosure must be reasonable. First, the court may require the party seeking disclosure to make a plausible assertion that a pass-on occurred. Second, the requesting party must provide evidence already reasonably available, for example through business dealings or otherwise available through third parties. As with respect to the collection of data and use of econometric techniques, the draft guidelines underline that the principle of proportionality is another restraint to the right of disclosure. Hence, national courts may consider costs and benefits of ordering the requested disclosure. In this context, the draft guidelines provide hypothetical examples in which disclosure – based on sufficient evidence already available – can be classified as unproportionate. It follows from the wording of the draft guidelines that a denial of a request for disclosure due to disproportion should not be the norm and should be used sparingly. Instead, the draft guidelines point out that even confidential information could be disclosed. However, it is the court’s responsibility to put measures into place to protect the concerned information. Regarding possible measures, the draft guidelines propose the use of data rooms and confidentiality rings. Disclosure of competition authority files can also be requested to prove a pass-on. According to the draft guidelines, however, disclosure of the competition authority files is only a measure of last resort and may be of low value when it comes to proving a pass-on, as the files typically do not include information regarding pass-on. Although the draft guidelines aim to harmonize the decision-making practice regarding pass-on, which also depends on the relevant disclosure rules, they emphasize that the responsibility regarding the process of disclosure will remain with the national courts. From the wording it appears that the draft guidelines implicitly encourage the national courts to be flexible when shaping the disclosure procedure, and ought to use the various instruments available to them under national procedural law. The draft guidelines provide a good overview of factors influencing passing-on of overcharges and the role of evidence. While various examples are provided for clarification, they also illustrate that the “one-size fits all approach” is not workable. Case-by-case, the application of different approaches and combination of approaches should be assessed, depending on, amongst others, the scope of the claim, the sum of potential damages, as well as the availability of evidence, data and previous research in the relevant industry. Hence, the draft guidelines underline the coherence of available data, quantitative evidence, econometrical techniques and the role of disclosure rules. It would, however, in our opinion be preferable if the draft guidelines could also take up on non-price effects. Regarding disclosure procedures, the draft guidelines emphasize that evidence obtained through disclosure plays a central role when it comes to proving passing-on (both for the indirect customer as a claimant and the defendant). As the disclosure rules in the damages directive are integrated in the civil procedure framework of each respective member state, we think that the usefulness of disclosure will to an extent depend on how the disclosure rules interact with the national framework. In general, it remains to be seen how disclosure is used in practice, but with regards to the information asymmetry it might very well develop to be the indirect customers’ most important tool to obtain (and therefore to provide econometric) evidence regarding a pass-on. CJEU 05 June 2014 C-557/12 (Kone) EU:C:2014:1317, para 22 with reference to CJEU 13 July 2006 Case C-295/04 (Manfredi) EU:C:2006:461, para 61. 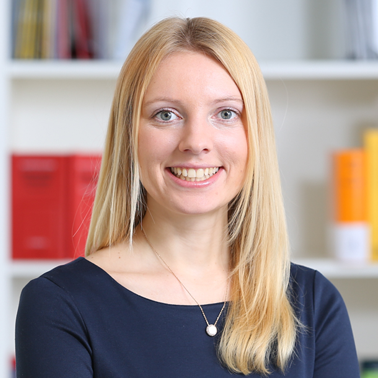 *Lisa Hamelmann is a staff attorney in the Düsseldorf office and Mikael Treijner is an associate in the Berlin office.